Haunt fans and thrill seekers gain special access to outstanding attraction, before the traditional October season. Raises funds for Thomas Fire Victims. 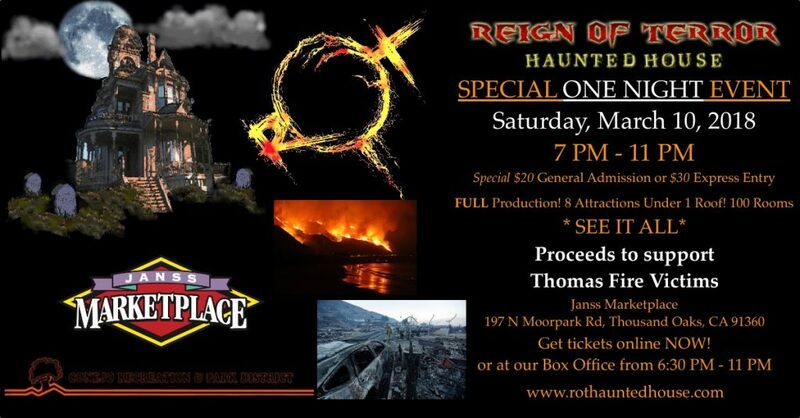 Reign of Terror Haunted House, winner of multiple awards as a leading immersive, horror-themed entertainment attraction in Southern California, featuring 100 custom-built rooms in 8 distinct bone-chilling themes, will be open to the public for a one-night special event on Saturday, March 10, 2018 from 7pm – 11pm. This special event will feature the haunted house’s full production, including over 40 live actors, dozens of characters and animatronics, plus professional grade special effects throughout, including customized sound, lighting, scents and fog. Covering over 23,000 square feet of floor space, a walk through the Reign of Terror provides a truly unique and thrilling entertainment experience. “We’re excited to open to the public and welcome our fellow haunters, horror fans and general thrill-seekers to visit Reign of Terror now, and not have to wait until next Fall,” said Bruce Stanton, Founder of Reign of Terror Haunted House. Tickets: $20 each for General Admission or $30 each for VIP Express Entry. Tickets available for purchase online any time through www.rothauntedhouse.com or at our on-site Box Office all night on March 10, 2018 starting 6:30pm. About Reign of Terror Haunted House: Located at the Janss Marketplace in Thousand Oaks, CA, the Reign of Terror Haunted House is a multiple-award winner for its immersive walk-through haunted attraction featuring 100 custom rooms across 8 interconnected, horror themed sections covering 23,000 square feet of floor space. Recently named a “Must-See Haunt Attraction in the United States” as well as the “Best Halloween Attraction for Los Angeles” and “Best Professional Haunt in Southern California”, the Reign of Terror Haunted House welcomes thousands of visitors through its doors each October. Entering its 19th consecutive season, Reign of Terror is constantly being refined, expanded and improved by a dedicated team of designers, construction workers, craftsmen, technicians, make-up artists, costumers and actors. Proceeds generated from ticket sales are donated to various causes, including the the Conejo Recreation and Park District‘s Young Artists Ensemble group and Thousand Oaks Teen Center, plus Make-A-Wish and Animal Rescue Charities.